What does this figure mean to you? How did I get this idea? Click here. 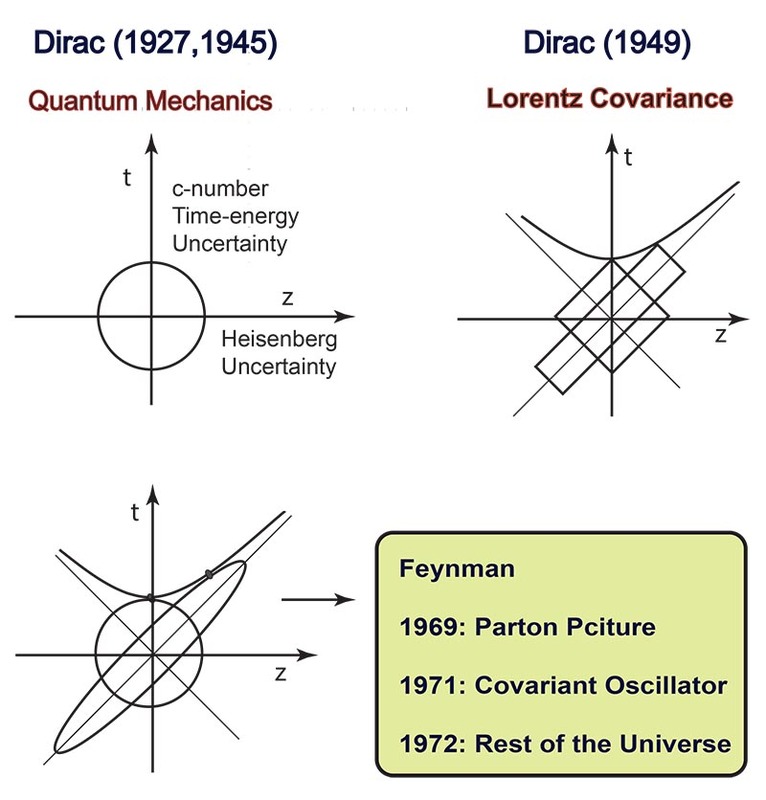 I met Paul A. M. Dirac in 1962. It was like Nicodemus meeting Jesus. Moses talked to God by writing books about God. They are of course the Five Books of Moses in the Old Testament. I wrote books and papers to approach Eugene Wigner. I am talking to Einstein by constructing this webpage. 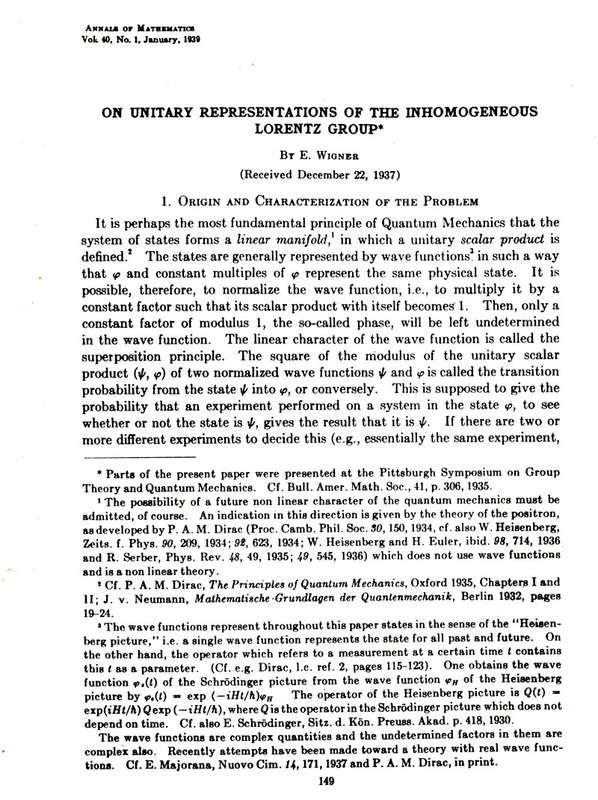 If you are interested in symmetry problems, you should be aware that Wigner's 1939 paper deals with the subgroups of the Lorentz group whose transformations leave the momentum of a given particle invariant. Thus, these subgroups dictate the internal space-time symmetry of the particle. It is generally agreed that Wigner deserved a Nobel prize for this paper alone, but he did not. He got the prize for other issues. Click here for my explanation of where the confusion was. Wigner liked my story. 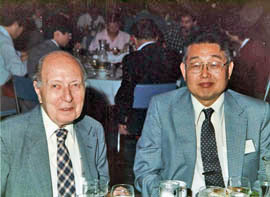 This is the reason why he had photos with me, and I am regarded as Wigner's youngest student, even though my thesis advisor at Princeton was Sam Treiman. One hundred years ago, Bohr and Einstein met occasionally to discuss physics. 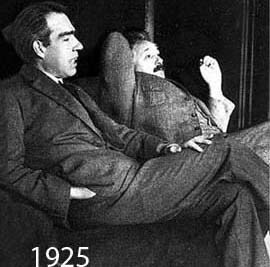 Bohr was worrying about why the energy levels of the hydrogen atom are discrete, while Einstein was interested in how things look to moving observers. Did they ever discuss how the hydrogen atom looks to a moving observer? These days, the proton acts as the hydrogen atom. It is a bound state of three quarks. Protons from high-energy accelerators are equivalent to those observed by moving observers. 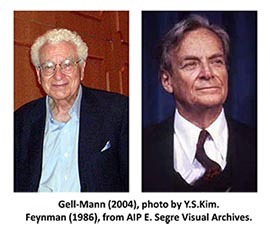 According to Gell-Mann, the proton at rest is a bound state of three quarks. According to Feynman, the proton moving with the velocity close to that of light appears as a collection of an infinite number partons. Are they talking about the same proton? In addition, there are two more fundamental questions. A massive particle at rest has three rotational degrees of freedom. However, a massless particle has only one degree of freedom, namely around the direction of its momentum. What happens to rotations around the two transverse directions when the particle is Lorentz-boosted? You also have been wondering why massless neutrinos are polarized, while massless photons are not. 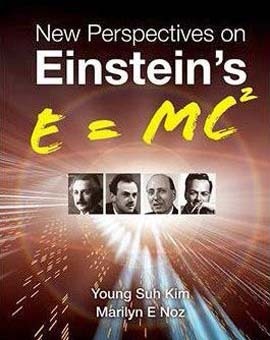 If you are interested in further contents of Einstein's E = mc2, click here. Is there a book on this subject? Click here. This book is available from many different sources. Paul A. M. Dirac used mathematical poems to express his ideas in physics. Richard P. Feynman used cartoons to explain his physics. It is fun to translate poems to cartoons. Interesting ? If you are interested in where Einstein stands among the philosophers, click here. You have seen the circle, ellipse, and hyperbola at the beginning of this webpage. 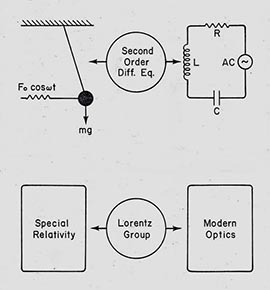 They illustrate further contents of Einstein's E = mc2. Rotate this figure by 45o. You will end up with the figure shown at the beginning of this webpage. 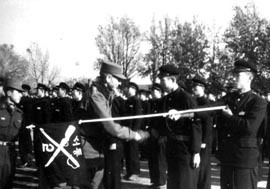 In this photo of 1953, I am shaking hands with General Maxwell Taylor, the commander of the U.S. forces in Korea. Under him were more than 300,000 combat-ready U.S.troops. I am in my high-school uniform. x2 + y2 = 2 .
e-2bx 2 + e2by2 = 2. When b = 0 , this equation is for the circle. 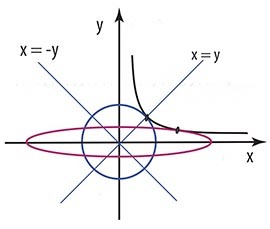 As b increases from zero to a positive number, the circle becomes squeezed to the ellipse as shown here. 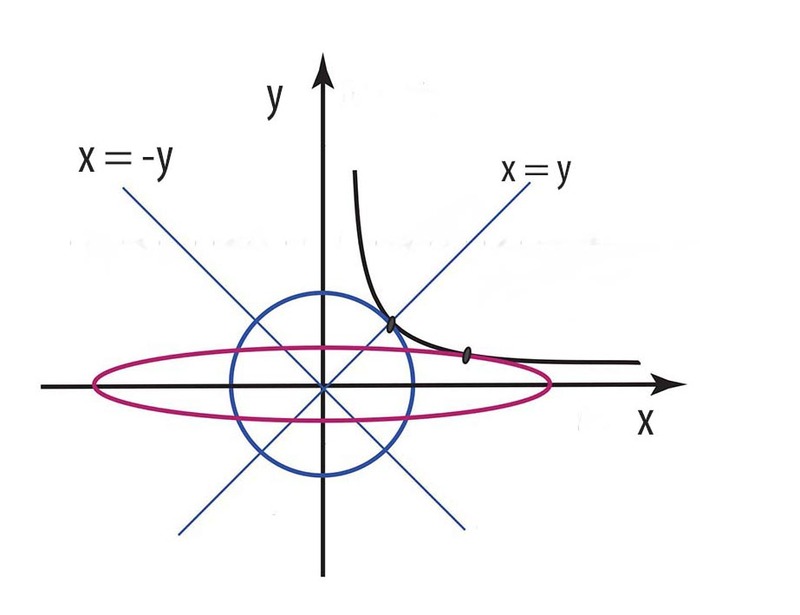 Exercise: The circle is tangent to the hyperbola at x = 0, when b = 0 The tangential point moves along the hyperbola when b increases. 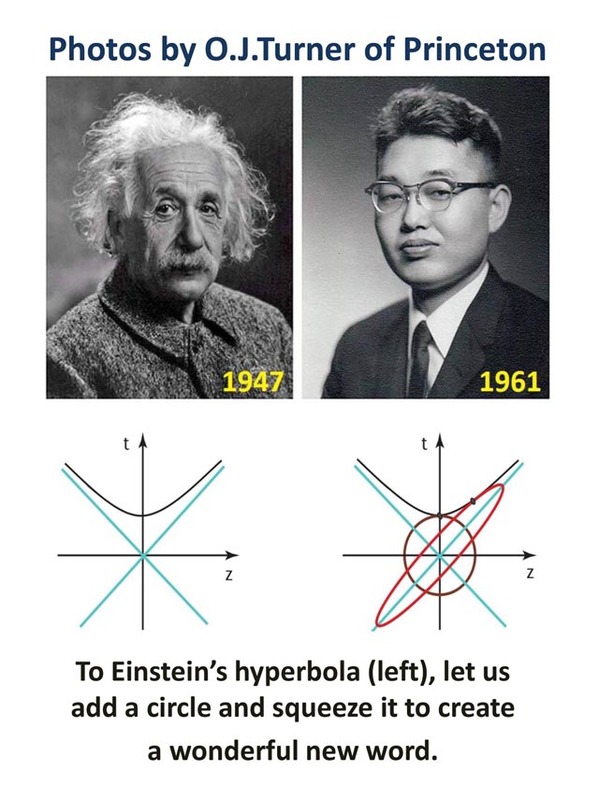 Find the exact location of the tangential point as a function of b.
I did this exercise during my high-school years (1951-54) in Korea, during the period of the Korean War (1950-53). My Korean background includes a strong Confucian influence. At the beginning of this webpage, I talk about Moses and Nicodemus. This means that I also have a strong Christian background. Did you know that Jesus and Confucius say the same thing? If you like modern optics, including coherent and squeezed states, beam transfer matrices, polarization optics, as well as periodic systems, click here. If you are interested in entanglement problems, particularly Gaussian entanglements, click here. If you are interested in entropy problems and Feynman's rest of the universe, click here, and here. Poincar� and Einstein? click here, and here. Poincar� sphere for polarization optics and the Poincar� symmetry for Einstein's relativity. Click here. This page is still under construction. Please come again. Acknowledgments. This page is based on the papers I published since 1973. I wrote many of those papers in collaboration with a number of co-authors, especially, Sibel Baskal, Elena Georgieva, Daesoo Han, Marilyn Noz, Seog Oh, and Dongchul Son. Michael Ruiz and Paul Hussar were my graduate students. They made key contributions to this program. I would like to thank them. I am grateful to Professor Eugene Wigner for clarifying some critical issues concerning his 1939 paper on the internal space-time symmetries of particles in the Lorentz-covariant world. Click here f or my webpage dedicated to Eugene Paul Wigner. copyright@2018 by Y. S. Kim, unless otherwise specified.